Arrays does not have add or remove methods. We need to mention the size of the array. Fixed length. So there is a chance of memory wastage. To delete an element in an array we need to traverse through out the array so this will reduce performance. We can access any element randomly by using indexes provided by arrays. Primitive type to wrapper classes object conversion will not happen so it is fast. Array can store many number of elements at a time. Check below for some of the interesting java interview programs on arrays. Here is the all possible ways of printing arrays in java. 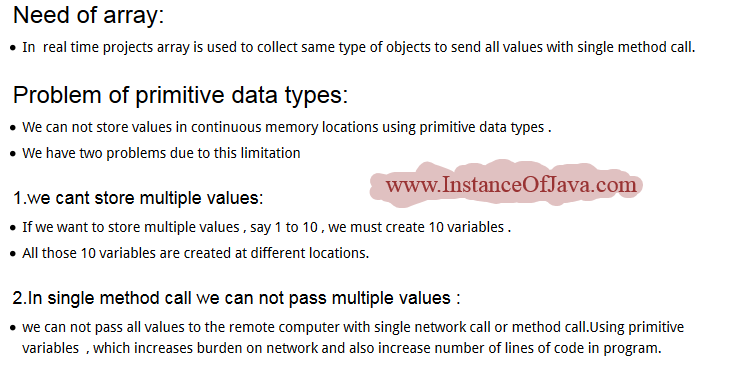 We can create array of objects in java. Check out this interesting article about array of objects in java computer programming. We can find missing numbers in java array lets see the below example program. Check this below post about how to find second highest number in an array.